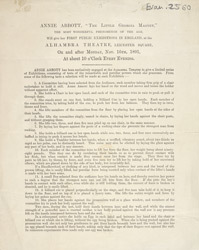 Annie Abbott is featured in this advertisement. She was a strong woman and was able to lift seemly impossibly heavy objects. Known as the Little Georgia Magnet, she came to England to perform her act in the 1880s. She opened at the Alhambra Theatre and was a huge sensation, people travelled from all over the county to see her perform. Situated on the east side of Leicester Square the theatre opened in 1854 as the Panopticon of Science and Art. It was converted into the Alhambra Palace Theatre in 1858. It finally closed as in September 1936 and was demolished to make way for a cinema.